Listening to the radio today I heard another story about the Phoenix, the Mars lander which had just successfully touched down near the north pole of the planet Mars. If all goes well, it will dig through the top layer of dust and scoop out soil from the layer of permafrost, in search of a record of the planet’s climate history and any traces of life. The contraption landed in summer, the NASA scientist on the program noted. That is, it’sn not as nasty as it is going to be. In winter, things get distinctly more unpleasant, as the temperature plummets and dry ice precipitates out of the atmosphere. When that happens, the lander dies. That’s when it finally hit me: the lander may be a lab right now, but it’s nothing but a heap of junk tomorrow, to join the scrap already there from prior missions. My sense of shock made me realize that I had innocently expected a scientific ethic of pack-it-in and pack-it out much like the frame of mind we’ve learned to adopt for visits to wilderness or even trips to the local state park. Rather than a basic respect for the environment under study, the mission appears to be governed by a sort of colonialist-imperialist disregard for whatever might be there. Nobody owns it, so you can do whatever you want? Or is it just that competitiveness fosters a blind arrogance to anything but “success” as the competition happens to define it? Isn’t there a scientific ethic that applies to situations like this that says you have to clean up after yourself? The story reminds me of Laurie Anderson’s stories of having been an artist-in-residence at NASA for a brief time made briefer by her sense of having wandered into a culture so foreign it ruled out meaningful conversation. From her account, she might as well have been a Martian. At the other end, the story also puts me in mind of the abandoned industrial hulks in the rust belt, such as those I ran into at Lake Calumet just two weeks ago. Further evidence of the compartmentalization of our culture, not just between different groups operating side by side to different ends, but between time frames. You can obviously divorce short-term gain, whether it’s profit or scientific knowledge, and long-term consequences with impunity. 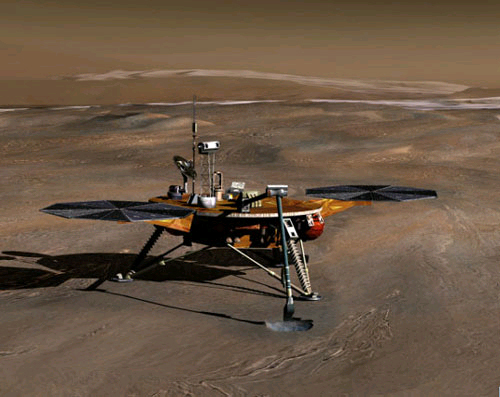 I imagine the total impact of a junked Mars lander isn’t that great. Nine hundred pounds of trash with a bunch of toxic metals wrapped up in it somewhere near the north pole isn’t that big a deal on a whole planet, I suppose, especially if no sign of life is found to which the toxins would be toxic. But the spirit to which it testifies makes me wonder where I can go to register my protest and demand an environmental impact statement. Quick Update: The European space agencies are working on developing a scientific ethics of space. UNESCO has a commision on the topic. The Union of Concerned Scientists is trying to address the issue of sustainability in space exploration and exploitation. All I could find for NASA and space ethics was the Office of the General Counsel, which is, amongst many other things, “responsible for developing the ethics and patent program requirements” of NASA. When ethics come up in the same breath with patents, hope takes a nosedive. Wired has compiled a list of weird space debris: Lost in Space. And Scientific American devoted an article to space trash in the wake of the satellite collision over Siberia in February 2009.